Playtime is the best time, and this activity table is the ideal place for it! With a flat, wide, smooth surface built by expert Amish woodworkers, this table provides a sturdy and durable space for games and activities of all shapes and sizes. Create some art, play a board game, complete a jigsaw, try some macaroni sculpture... the list is endless! Every inch of this table is built by hand in the USA, offering you the peace of mind that comes with knowing exactly where your child's furniture comes from. Children are at the heart of the Amish way of life, and this table is crafted with those precious family members in mind. If you've any questions at all about this piece, please don't hesitate to get in touch by phone or email! 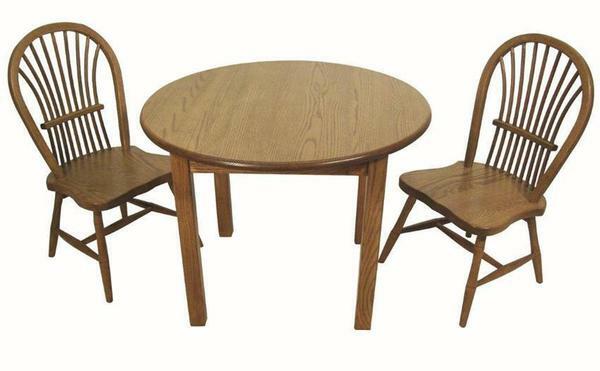 This table looks great with our hand-turned Sunburst children's chairs, too - click to learn more. Floor to Top of Seat Height: 11 1/4"
Floor to Top of Back Height: 26"
This is for the table only, chairs are not included in cost.